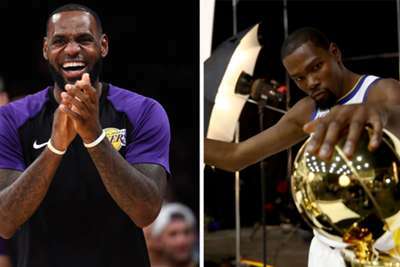 While the Golden States Warriors will once again be favourites to win the NBA Western Conference, LeBron James' arrival with the Los Angeles Lakers suggests a new champion could be on the horizon. That new champion may not emerge this season as James is surrounded by young players along with several journeymen, but if the four-time MVP can get a player like Kawhi Leonard to join him next season, there could be a power shift coming in the West. That being said, until a team proves it can beat the Warriors, this is Golden State's conference. We take a look at the Western Conference in 2018-19. With the addition of LeBron, Los Angeles are projected by bookmakers to win 13 more games than they did last season (48.5). While that may be a little bit optimistic considering the depth of the West, the Lakers are bound to get much better simply with the addition of 'The King'. After acquiring former Chicago Bulls guard Jimmy Butler during the offseason in 2017, the Timberwolves went from 14th in the West with 31 wins to eighth with 47. Now Butler wants out, and until Karl-Anthony Towns and Andrew Wiggins prove they can lead this team to greener pastures, it would be far too optimistic to say they will win more than 40 games. Minnesota was 10-13 without Butler in their line-up last season. The Mavericks may not make the playoffs, but with the addition of DeAndre Jordan, a second year for Dennis Smith Jr., a stud rookie in Luka Doncic and added talent around Harrison Barnes, it is not unrealistic to say Dallas, 24-58 in 2017-18, could win another 10 games this season and possibly even more than that. The New Orleans guard had a coming-out party of sorts in the first round of the playoffs, when the Pelicans swept the Portland Trail Blazers. Holiday averaged 23.9 points, 6.3 assists and 5.7 rebounds in the postseason and 19 points per game in the regular season. He dominated Portland's backcourt defensively and he may now have the attention to earn a second All-Star selection. OKC struggled all last season to incorporate Carmelo Anthony into their offense and it cost the team wins throughout the season. Now it is the Russell Westbrook and Paul George show and with an entire season focusing on that, the Thunder should win the Northwest. This is perhaps the most clear-cut division in the NBA. Houston lost two big defensive pieces in Trevor Ariza and Luc Mbah a Moute, but their biggest threat in the division, the Pelicans, lost DeMarcus Cousins, a huge reason for New Orleans' success against the Rockets. Add that to a division with the Mavericks, Memphis Grizzlies and a recently injury-riddled San Antonio Spurs team, and Houston should win the Southwest again. Golden State are the four-time defending champions in the Western Conference and the two-time reigning NBA champions, and they added one of the best centers in the game in Cousins. They also lost virtually nothing from their core. The Warriors still have Kevin Durant, Stephen Curry, Klay Thompson, Draymond Green and Andre Iguodala. They lost JaVale McGee and Nick Young, and are still trying to figure out Patrick McCaw's contract, but Quinn Cook, Jordan Bell and Kevon Looney all got valuable postseason experience last season. And Shaun Livingston is back too. This team is stacked and might be even better than they were last year.